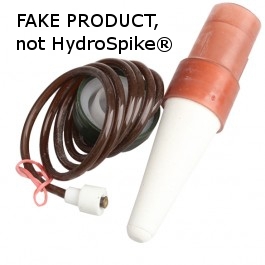 Please be aware of these fraudulent sellers who claim to sell HydroSpike® product, but are selling counterfeit product. *How can you tell what is authentic? Authentic HydroSpike® product has our HydroSpike® logo and is packaged in a clamshell as you see our website. 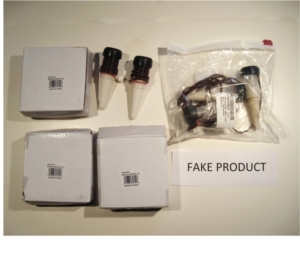 Fake product comes in a white box, bag or other form as seen to the left. HydroSpike® is trademarked by the United States Patent Trademark Office and belongs to HydroSpike, Inc., exclusively. Law-breakers will face legal action. Please help us make the world a safer place by reporting fraudulent sellers to your retailer and not buying their fake products. Please see our list of Authorized Retailers or contact us if you have questions. >This seller sometimes fulfills through Amazon and sends customers fake spikes in a white box. This seller also copies HydroSpike’s unique UPC code and places on the box. All authentic HydroSpike® product comes as shown in the picture. Past seller reviews also have indicated that a number of customers have experienced bait and switch by this seller. Please report to Amazon immediately and do not support criminal activity. >This seller sends customers fake spikes in a white box or plastic ziplock bag. This seller also copies HydroSpike’s unique UPC code and places on the box or bag. All authentic HydroSpike® product comes as shown in the picture. This seller has also tried to confuse customers by using his Perky Posey brand as HydroSpike® brand. HydroSpike® is trademarked by the United States Patent Trademark Office and has nothing to do with any other brand or product like it. >This seller sends customers fake spikes in a white box or plastic ziplock bag. This seller also copies HydroSpike’s unique UPC code and places on the box or bag. All authentic HydroSpike® product comes as shown in the picture. >This seller has misled customers in the past with product description, photo, and country of origin of their products. For some time, they wrote that their probes were from Austria when in fact they are manufactured elsewhere. Their probes come in a plastic bag and customers have complained that they were broken. We have done test orders as proof, please contact us if you would like further information. >These sellers mislead customers to think that the manufacturer is packing HydroSpike® in unprinted boxes and plastic bags in their product description, which is completely false. HydroSpike products ONLY come in its original clamshell packaging with a designed front and back with our HydroSpike® logo, as seen in our website product photos. FALSE DESCRIPTION, PLEASE REPORT IMMEDIATELY TO EBAY: “New: A brand-new, unused, unopened, undamaged item in its original packaging (where packaging is applicable). Packaging should be the same as what is found in a retail store, unless the item is handmade or was packaged by the manufacturer in non-retail packaging, such as an unprinted box or plastic bag. See the seller’s listing for full details.” Please report this as it is a violation of HydroSpike® trademark rights, and do not buy fake products from violating sellers who support criminal activity.